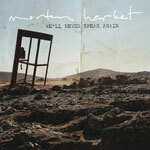 The third track from Morten's album "Letter From Egypt" was "We'll Never Speak Again". This was produced as a promo only CD in Germany (released August 2008) and was also available as a download in Norway (June 2008). The artwork for the download features a picture of a deserted telephone box. 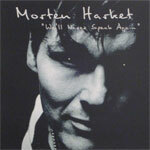 "Morten Harket" is printed in white letters across the top with the title "We'll Never Speak Again" in black typed-font below. The promo CD comes in a card sleeve and has a close-up black and white shot of Morten's face on the front. Morten Harket and the title (printed within quotation marks) are printed in white at the top. The back of the sleeve is white with the title and track information in black. The text "Not For Sale - For Promotion Only" is printed towards the bottom of the sleeve. The disc is silver with black text and also has "Not For Sale - For Promotion Only" printed on it. The CD features the "radio edit" (3:43).